Pocono Biking will take you on the best trails in the area with multiple adventures. 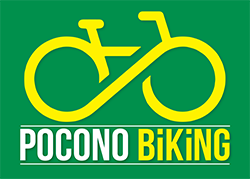 Pocono Biking is open for trail exploration April through October. A popular trip is the BIG DAY OUT, which includes hiking, biking and rafting. You'll ride over 20 miles of beautiful Rail Trail, enjoy a hike at Glen Onoko, and raft the mighty Lehigh River! In addition, you'll get three meals, water and snacks throughout the day, and a free beer in a BIG DAY OUT mug! Come conquer one of the best hikes in the area! Call today to book your hike, Big Day Out, bike trip, rafting trip or other adventure!